for $3,495,000. The lot size is 2099 X 1489 X 1489 X 2163. 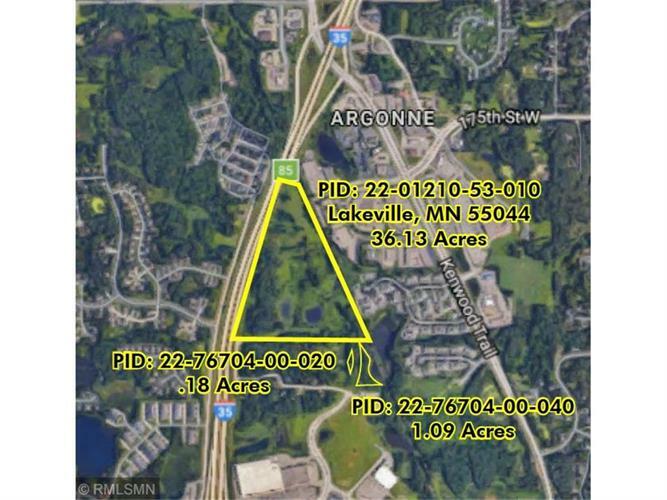 Also includes parcels: 22-76704-00-020 & 22-76704-00-040 for a total of 37.04 acres of prime C-3 zoned undeveloped property in Lakeville. Adjacent and easy access to I-35 with 2015 AADT of 82, 000. Near Target and many surrounding neighborhoods and businesses. Lakeville ISD 194. Ideal for mixed use, big box, retail, senior living community or apartments. Please contact city of Lakeville engineering for development plan questions.